Caponi Art Park, and its unique spaces, art and earthworks, is a distinctive place to inspire photographers to shoot images unlike any other. Visitors are welcome to take still photographs and videos for personal, noncommercial use. Consider entering your photographs into the Photo Contest and Exhibition. The Art Park is also used by commercial photographers for nature stills, family photos, senior pictures and engagement portraits. All photographers should honor these policies when using Caponi Art Park as a backdrop for any photography or filming. Respect the art and earthworks: Do not climb on the sculptures, walls, trees, delicate moss or gardens. Be respectful to other visitors: Photographic equipment should not encumber or interfere with other visitors enjoying the park. Capturing photographs for weddings, engagements, senior pictures and family portraits is permitted for a fee. Please see below and contact the park office at 651.454.9412 to obtain a permit. Commercial Videography of park events and programs is not permitted except with prior consent from park staff and performer(s). 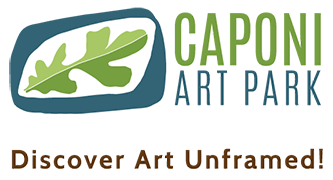 Caponi Art Park is a nonprofit organization. Permit fees help to maintain the beauty of the park and ensure it remains free and open for the community to enjoy.